 In the Company of the Holy Mother. pp. 66-67.  Attributed to Brooke Westcott in Mixer and Server. Hotel and Restaurant Employee's International Alliance and Bartenders' International League of America.. 1929. Elias truly shall first come, and restore all things. But I say unto you, That Elias is come already, and they knew him not, but have done unto him whatsoever they listed. Likewise shall also the Son of man suffer of them.  The Gospel of Matthew 17:11–12 (KJV), talking about the Prophet Elijah. suffer it to be so now: for thus it becometh us to fulfil all righteousness.  The Gospel of Matthew 3:15 (KJV), said to John the Baptist. 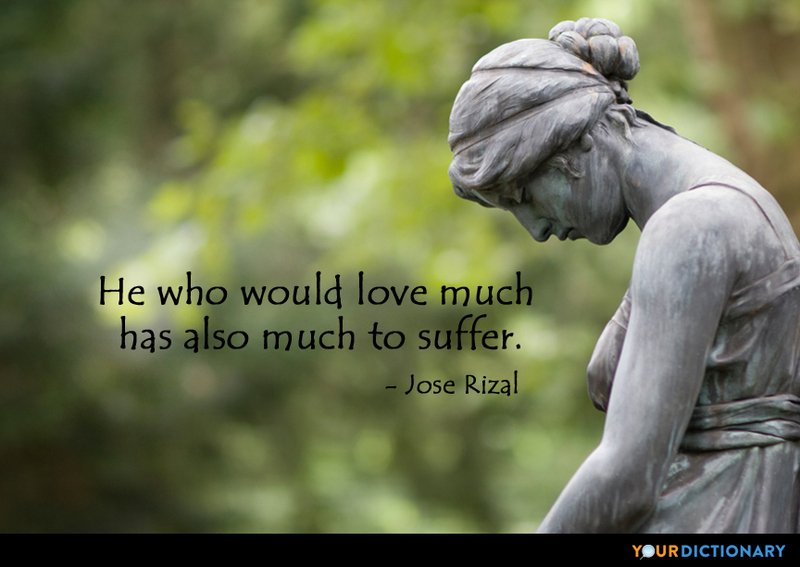 The worst illness of our time is that so many people have to suffer from not ever being loved. suffer little children, and forbid them not, to come unto me: for of such is the kingdom of heaven. Endure what is difficult to endure and to suffer what is difficult to suffer.  1945 Declaration,15 Aug. Quoted in Hugh Cortazzi The Japanese Achievement (1990).  What Must We Do To Be Saved? (1880) Section X, "The Evangelical Alliance." Who breathes must suffer, and who thinks must mourn;And he alone is bless'd who ne'er was born.  Solomon on the Vanity of the World, book iii, line 240; reported in Bartlett's Familiar Quotations, 10th ed. (1919). When you oppose the shaykh, it's like the slave who kills himself over a quarrel with his master. Hey, why are you killing yourself over a quarrel?He says, So my master will suffer loss.  Me & Rumi translated by William C. Chittick from Maqalat-i Shams-i Tabrizi. For the millions that suffer unjustly, the Confessing Church does not yet have a heart. To suffer woes which Hope thinks infinite; To forgive wrongs darker than Death or Night; To defy Power, which seems Omnipotent; To love, and bear; to hope, till Hope creates From its own wreck the thing it contemplates; Neither to change nor falter nor repent; This, like thy glory, Titan! is to be Good, great and joyous, beautiful and free; This is alone Life; Joy, Empire, and Victory!  Demogorgon, Act IV, closing lines. Moreover, nothing is so rare as to see misfortune fairly portrayed; the tendency is either to treat the unfortunate person as though catastrophe were his natural vocation, or to ignore the effects of misfortune on the soul, to assume, that is, that the soul can suffer and remain unmarked by it, can fail, in fact, to be recast in misfortune's image. Men have been taught that their first concern is to relieve the suffering of others. … To make that the highest test of virtue is to make suffering the most important part of life. Then man must wish to see others suffer in order that he may be virtuous. Such is the nature of altruism. I would rather suffer the end of Romulus a thousand times. I would rather die in agony, than accept assistance from you.  Note: Nero's ship was being destroyed by a black hole, and Kirk offered him a chance to evacuate. Nero adamantly refused, and Kirk ordered the Enterprise to open fire, accelerating the destruction of Nero's ship and killing him. Nero was from the future, where the Starfleet Enterprise had offered assistance in saving his planet from destruction via a black hole, but they failed, which is what drove him to come back in time motivated by revenge, and why he decided he would rather die than accept assistance from them. I suffer from girlnextdooritis where the guy is friends with you and that's it.